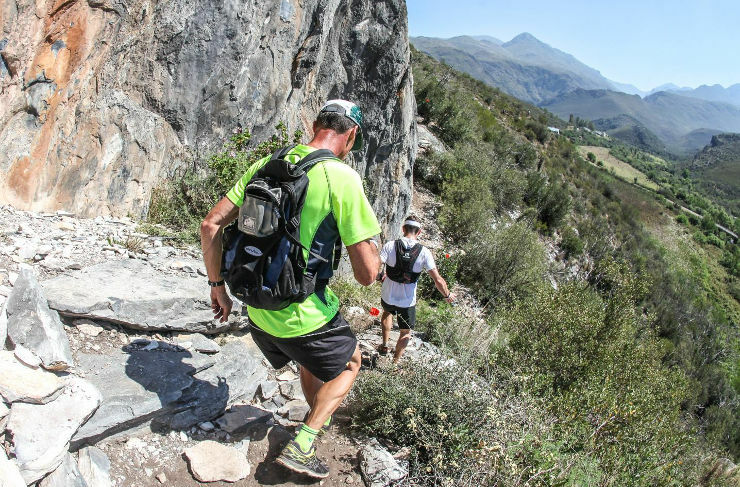 John April and Ettiene Plaatjies increased their overall lead in the men’s team category when they won stage two of the Dryland Traverse at the De Hoek Mountain Resort near Oudtshoorn in the Western Cape today. They completed the 24km trail run in 1:53:11 to beat Francois Massaqua and Anderson Ncube (2:04:13). Third were Mauritz Jansen van Rensburg and JC Visser (2:24:15). Riette van Rensburg and Lize du Plessis (2:49:45) took the spoils in the women’s team event. They were followed by Kerrin Watson-Smith and Elani Eckert (2:53:20) with Chris Mare Schoeman and Magdelena May Venter (3:02:21) rounding out the podium. The mixed victory went to Kathleen Shuttleworth and Antonie van der Westhuizen (2:32:35). Peter Botha and Mart-Merie Reyneke (2:44:00) finished second, followed by Joline and Chris Sturdy (2:55:51). Robert Rorich led the solo men’s race home in 1:48:49, beating Niel Swanepoel (2:02:24) and Michael Bester (2:07:49) to the finish. The solo women’s race was won by Jo Mackenzie in 2:24:08. Second and third were Natasja Kask (2:34:45) and Tanya Moller (2:42:43).